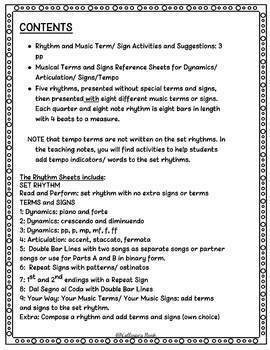 Spice your rhythm reading and performance activities with music terms and signs! Combine steady beat rhythm reading and performance with recognition and demonstration of a variety of terms and signs. Students read and perform rhythms with dynamics, repeats, articulation signs, bar lines and different endings. They add their own choice of terms and sign indications to their rhythm compositions. Aural, reading, listening, composition and instrumental activity instructions, supporting the teaching of terms and signs and rhythm reading, are listed in the teacher notes. 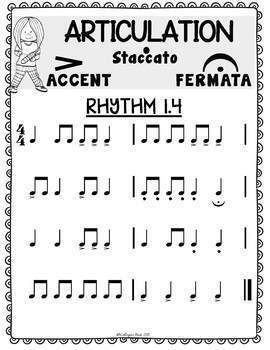 Use the rhythms and terms and signs for rhythm reading and performance assessments. Set up centers with students, investigating, practicing and experimenting with one or more music term or sign. 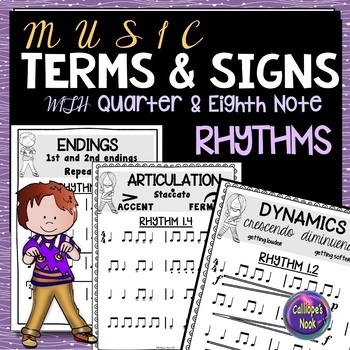 ☑ 5 eight bar rhythms using quarter and eighth notes, displayed with no terms and signs, and then displayed eight more times, each with a focus on a different term or signs. 5 Double Bar Lines dividing the rhythm as separate songs/ partner songs, or use as binary form structure. 6 Repeat Signs with patterns/ ostinatos: the rhythm is divided into 4 two bar patterns. 9 Your Way: Your Music Terms/ Your Music Signs: add terms and signs to the set rhythm. *Note that the rhythms are written with traditional notation. *Tempo terms are listed in the reference sheets. These rhythm sheets are designed to be performed at a steady beat. 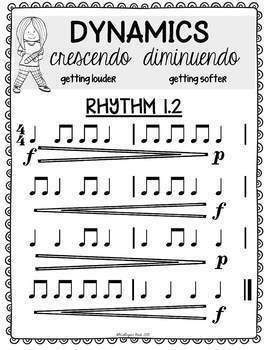 Within the teacher notes you will find several suggestions for activities using the rhythms with tempo terms and changes. Tempo changes are not written on the rhythm sheets. Want to hone those rhythm skills? Interested in products that reinforce rhythmic and melodic concepts?